Jillian was turning 18 and no ordinary cake would do! 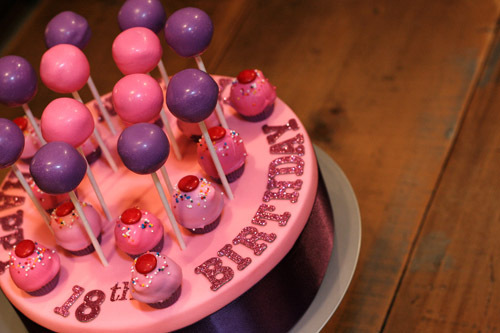 But bite-sized, moist, chocolately cupcakes and cake pops fit the occasion perfectly. To make the celebration even more special, Jillian’s treats were displayed on a custom pink stand to mark her special day. This entry was posted on Tuesday, October 19th, 2010 at 6:49 pm	and is filed under Birthday Pops, Recent Creations.